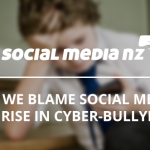 Want to win a free guest pass to the 2014 NZ Social Media Forum? We’re proud to be teaming up with the team at Conferenz to provide one lucky person the chance to head along to the NZ Social Media Forum (#NZSOMO) on 31 June – 1 July with a guest pass. If you want to grab this opportunity just click the button below, fill out your details and tell us why you want to go! With speakers from Twitter, Google, Facebook, LinkedIn and many more – it’s shaping up to be an awesome event! Winner will be drawn at 12pm on Monday 23 June 2014. You will need to organise your own flights and accommodation. I would love to go to the SoMe conference because I can do a really amazing Donald Duck impression. Isn’t that what social media is all about? Sharing authenticity – being real in both professional and personal lives. The power of social reach to be who you are.